My car, as it was parked on the day. Taken at the very height of my angst. I parked legally. I paid for parking. I am 100% sure. If, once upon a time, you have returned to the space where your car is meant to be, to find it has been helpfully removed to a much safer parking pound by some nice men with a big lorry who want £200 from you to give it back, you tend to pay very close attention to parking signage and where you park your car. You do not make the same mistake twice. Therefore the following debacle has come as somewhat of a surprise…. I parked my car in my usual space on a Camden Street. I used the convenient pay by phone method (convenient when it works – an experience to make you want to go on a killing rampage when it doesn't). Imagine my surprise the next morning when I came out and found a parking ticket on the car. I checked the time (still within time paid for), I checked the sign (shared use) and I checked the parking bay (I ‘lost’ a car once when I didn’t notice a tiny broken line denoting the end of one bay and the start of resident’s bays). But there was this ticket. Thankfully in the modern age I was able to take photographs. Several of them. Of my car parked correctly. Of the signage. Everything. I even bumped into the traffic warden (wish I had taken his photo now) and we exchanged a laugh at his silly mistake and we agreed the best way forward was for me to appeal the ticket. Internally I agreed the best way forward was to grab his book of tickets, rip it to shreds, and push him into a puddle in a Laurel and Hardy kind of a way. But I am not a violent kind of a person – physically anyway. So I wrote a strongly worded letter of appeal (alright, I filled in the online PCN form – but I tried to word it strongly). Job done I thought. I’d parked correctly, I’d paid, I’d taken photographs. All sorted. Just sit back and wait for the grovelling letter. Thank you for your letter received on 20/11/2012. This Penalty Charge Notice was issued because the above vehicle was observed parked in a residents’ or Shared use parking place or Zone either displaying an invalid permit or voucher or pay and display ticket, or after the expiry of paid for time - residents’ bay. I understand from your correspondence that you are contesting the Penalty Charge Notice because you paid for cashless parking session over the phone and therefore believe you had parked in a pay & display bay, but have decided to enforce the Notice. The reasons for my decision are detailed below. The notes made by the Civil Enforcement Officer [we used to call them traffic wardens] at the time the Penalty Charge Notice was issued confirm that paid for time was made. However the vehicle was parked adjacent to a time plate stating that the bay was for the use of resident permit holders only from Monday to Friday between 8:30am – 11pm and on Saturdays and Sunday from 9:30am to 11:00pm [all incorrect. It was 8:30am to 6:30pm and 9:30am to 5:30am and it also said Or pay at machine. I feel like a very pedantic David Mitchell or a normal everyday Sheldon Cooper now…]. The cash less [sic] parking you purchased you purchased [sic – yes he did repeat ‘you purchased' twice actually sic and tired of the typo’s now] was therefore not valid in this location. I have noted the comments in your correspondence and whilst I appreciate that you may have been confused as to the restrictions of the bay, I am not satisfied that this gives sufficient grounds to cancel the notice. Please also be advised that if the council does reject any formal representations that are made by the registered keeper of the vehicle the registered keeper will have the option of appealing to the Parking And Traffic Appeals Service who are an independent adjudication service. So. It’s a good job I have a sense of humour. And a camera. Here is my response to Roland and Camden Council….. Many thanks for your letter of 29th November which I have read today. The penalty charge notice was issued because of a high level of incompetence within your operation: My car was parked in a shared use parking bay within the time period of paid for time as my invoice sent to you shows. I understand from your correspondence that you are ignoring the points raised and not capable of even seeing the information contained in your own photographs, but have decided to continue to enforce the notice. The reasons for my decision are detailed below. You state that the time plate was for the use of residents, however, the fifth picture of your letter (bottom row middle photo) shows a lengthy time plate – the reason this plate is so lengthy is because the bottom section has an arrow on it which says ‘or pay at machine Display ticket Max stay 2 hours, thus making the area I parked in a shared use bay. This negates your argument that I was parked in a bay that was solely for residents’ use. We have already agreed that the time I was parked was paid for, so I’m sure that should be the end of the matter. Your colleague who spoke to me (The Civil Enforcement Officer) on the day (see previous letter) did not state that I was parked incorrectly, rather that he had phoned the office to see if I had paid for parking – and that whoever he spoke to could not trace my payment. Subsequently I have been able to produce a receipt for the time paid. The parking ticket you issued shows that I was parked in a shared use bay – I have parked there on numerous occasions and am familiar with where the shared use area begins and ends. 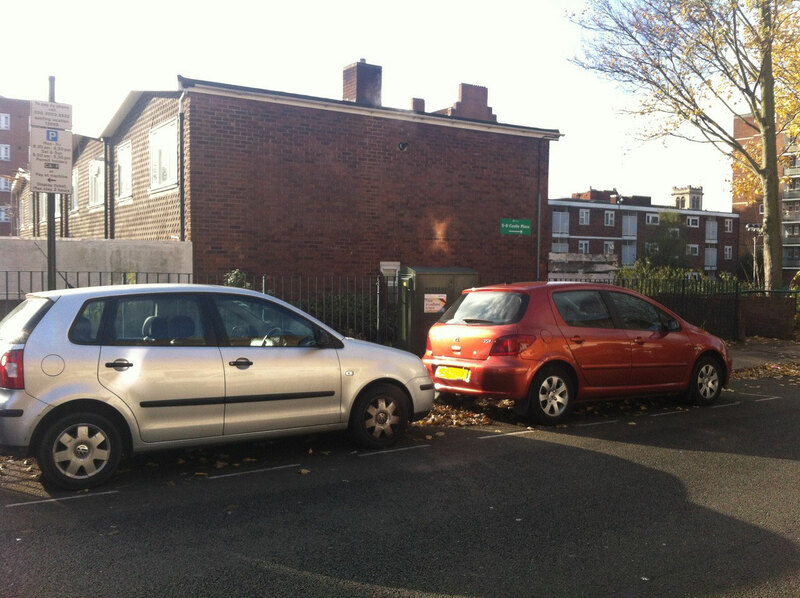 Your photograph supports this – the sixth photo – (bottom right of your collection) shows my car adjacent to the green telephone exchange box on the pavement. If you look closely you will see that the white lines of the shared use bay end just after the front of my car. There is a gap of a few metres, and that is where the resident’s bay begins. There is absolutely no confusion on my part – but there seems to be a great deal on yours and your staff’s – namely : a) They were unable to trace my payment b) The photograph of a shared use time plate being shown on my letter from you, whilst you are describing a resident’s only bay (which incidentally you have quoted the wrong times for in your letter and c) my car being photographed within the shared use bay next to the green telephone exchange box. I have another excellent picture taken of my car, taken by me, which shows in one picture, my car parked in the end of the bay, next to the green telephone exchange box, with the shared use time plate also in shot. I have enclosed that. Game, set and match. I have noted the comments in your correspondence, and whilst I appreciate that you probably have lots of work to do and may be overworked and underpaid, and also confused as to what a shared use time plate looks like I am not satisfied that this gives you sufficient grounds to pursue this Notice. Please note it is the responsibility of Camden Council to ensure that the staff working for them have a level of competence to allow them to carry out their duties ensuring that Penalty Charge Notices are correctly issued and that those dealing with any correspondence relating to them know the difference between a resident’s bay time plate and a shared use time plate. Whilst I appreciate that you may have not spotted this the first time, and that you wrote the letter to me in good faith, I am satisfied that the photograph I have supplied you is sufficiently clear in accordance with the ‘Replying to silly letters from Camden Council Regulations (as amended and made up by me today) 2012. Therefore on this occasion I do not find sufficient grounds for me to pay this PCN. Further information about me can be found on www.lewisbryan.co.uk . You may also wish to follow the hashtag #cancelthePCNroland on Twitter. For the reasons outlined above I am going for a nice brisk walk and looking forward to hearing that this has been cancelled very soon. If you have access to the internet you may want to buy a better camera for your Civil Enforcement Officers (what's wrong with calling them Parking Attendants?) online. If you wish to apologise in person you can visit my website to find out which comedy gigs I’ll be at in the coming weeks. If you choose not to apologise and cancel the PCN I look forward to writing a stand-up routine about this and using the hashtag #cancelthePCNroland for the foreseeable future. I must make clear that by the time you do withdraw this PCN Camden Council may have been severely mocked for its incompetence. That'll show them, I think. I will have posted the letter by the time you read this. I'll keep you posted as to how they respond. In the meantime if you wouldn't mind asking @camdentalking on twitter to #CancelThePCNRoland I'd be much obliged.